The Australian Nuclear Free Alliance (ANFA) welcomes the announcement that the Central Land Council, following instructions from Full Council delegates, will not undertake further consultation on a proposed nuclear waste dump in the Tanami Desert, approximately 350km North-West of Alice Springs. Australian Nuclear Free Alliance co-chair and Larrakia Traditional Owner Donna Jackson said the national network remained deeply concerned that the Federal Government push for a remote centralised waste dump would result in Aboriginal landholder’s rights to free, prior and informed consent being trampled. “Minister Macfarlane is pushing Land Councils to undertake consultation with Traditional Owners about new sites despite not providing them key details including the full waste inventory or details of compensation to be offered. The Muckaty area is also one of the most seismically active zones in Australia, which contradicts the federal governments position requiring a geologically stable site,” Ms Jackson added. Muckaty Traditional Owner Dianne Stokes said; “CLC is listening to the traditional owners and working very strongly, saying they will not go ahead and support a nuclear waste dump in their area. We want the NLC to do the same thing. They need to snap out of it. There will be no nuclear waste dump inside the Muckaty Land Trust no matter how hard they try. This is why we say that the land council boundary needs to be moved back out of Warlmanpa country, so the CLC can take care of our land rights. We trust how they work and we are very happy with the support they gave us on this struggle. “We want Ian Macfarlane and the NLC to stop pressuring traditional owners, asking them about giving their land for the waste. We have been under so much stress through this. We lost a lot of old people while we were fighting the last site. They were so worried about what would happen to their country. Instead of the country dying, they did. Enough is enough, “ Ms Stokes concluded. 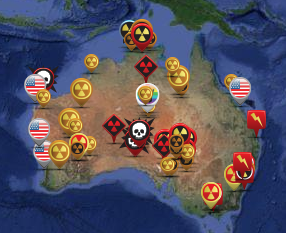 The Australian Nuclear Free Alliance has joined with a range of civil society groups calling for the establishment of a national radioactive waste management commission to examine all options for waste management.